Posted on June 29, 2010 by Dramabee Kids! 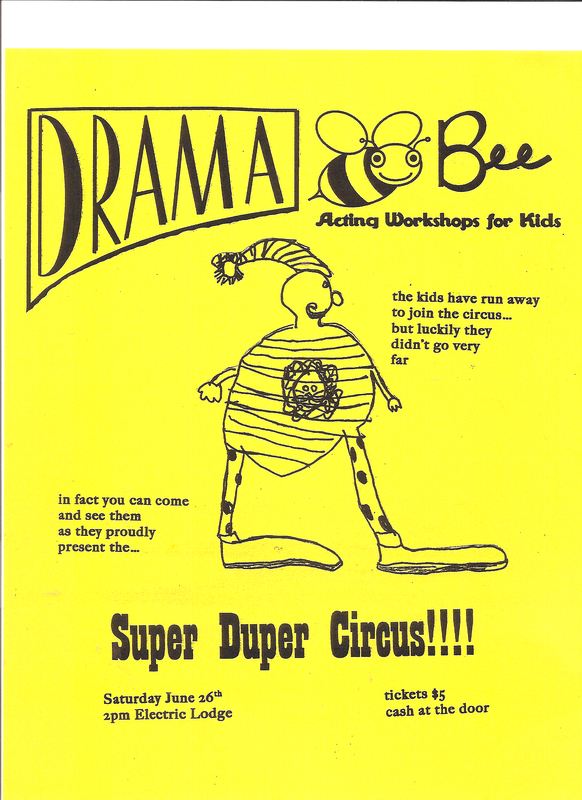 Together we created a fantastic ‘Summer Play’ – through a series of improvisations, drama games, story-telling, creative movement and discussion – an original piece of theatre, stemming from the wonderful imaginations of the children was be created. During this amazing and fun-filled process the children learned the skills of the stage, including vocal projection, blocking and taking direction……but more importantly their stories were heard, workshopped, turned into a script and finally performed ‘live’ on stage in the black box theatre at the Electric Lodge! Prop making, Posters, Fliers, Costumes and Programs – ….and together, oh yes, we made it happen!…..We experimented with all kinds of techniques to create our supplies, including felting, tie-dying, scanning and painting. To fully embody our summer experience we spent time every day at the beach – swimming, boogie-boarding, beach-balling, sandcastle-making and hanging out! Tuesday am “tie-dye with Tiffany” + ice-cream sundae! Wednesday am Boogieboarding at the beach! + juice slushie! Thursday am Mask making + make your own sandwich! Posted on June 18, 2010 by Dramabee Kids! Come one, Come all…THE CIRCUS IS COMING TO TOWN! !